To understand the significance of a “pond hockey” tournament, you’ve got to appreciate the deep meaning of pond hockey to men and women who grew up in cold-climate states such as Minnesota. Pond hockey enthusiasts grew up playing hockey on frozen ponds in their back yards, on a neighborhood creek or in a local park. They cleared the ice with shovels, not zambonis. Instead of $149 pads, they protected their shins with old magazines held with duct tape. Wooden boards with small holes served as goals, eliminating the need for a goalie. No frustrated parents on the sidelines berated the coaches or the kids. 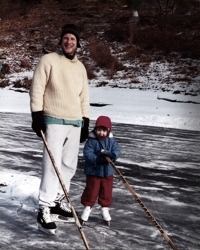 It was hockey the way nature intended –– outside in the elements during the absolute coldest time of year. Only a few people have kept the game alive into adulthood. One of them is Fred Haberman, co-founder of Haberman, Modern Storytellers for Pioneers. 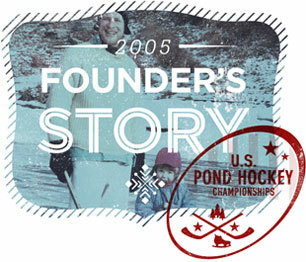 Crashing headfirst into mid-life crisis in 2005, Fred had a vision: create a national pond hockey tournament. Fred perfected the idea as he painstakingly shoveled and smoothed his own backyard pond on a peaceful creek. In 2006, the first-ever U.S. Pond Hockey Championships drew nearly 120 teams of pond hockey players from across the nation to Minneapolis to play on 25 rinks. Tens of thousands of spectators cheered them on. And, the tournament proudly donated a portion of its profits to youth hockey charities, The Herb Brooks Foundation and DinoMights. In 2010, after a successful five years and some of the best times of their lives, Haberman passed off the Golden Shovel to a passionate group of hockey fanatics that now carry on the pond tradition: Justin Kaufenberg, Carson Kipfer, Greg Blasko, and the SportsEngine team. Justin Kaufenberg started skating in the same month he learned to walk. His grandfather, father, and three brothers were all accomplished hockey players, so it was only natural that his "job" throughout his teenage years was that of the Lions Park Outdoor Rink Attendant. The old-timers still joke that Justin was the only rink attendant in Shakopee history to spend more time in the warming house than in the classroom—but with a fold-up bed stashed above the old zamboni room, there was no reason to be anywhere else. Even as Justin went on to a successful high school, junior and collegiate hockey career, his treasured winter highlight remained reuniting with old buddies on the pond for a day of pickup hockey, the way it was meant to be played. Full of camaraderie, creativity, and laughs. A state away in central Wisconsin, a large majority of Carson Kipfer's childhood and adolescent waking hours over the winter months were spent on his parents’ backyard pond, nestled between picturesque banks of towering pines. The Kipfer family back porch resembled a crude hockey superstore, with enough skates and miscellaneous gear to outfit even the most ambitious Saturday morning crowd. A fire pit and dilapidated picnic table on the shore offered brothers, cousins, and friends a place to warm their hands before tightening their skates and heading back out on to the pond to shovel the ice clean and once again pursue their quest for glory. Meanwhile back in Minnesota, Greg Blasko was busy organizing world-class sporting events while still in high-school. A genius of operations and organized chaos, Greg built a national reputation for being an "event mastermind" by the time most of his classmates had managed to obtain their driver's licenses. Justin, Carson and Greg's stories collided while attending college at the University of Wisconsin–Eau Claire, where they instantly shared a bond fueled by their passion for the sport of hockey. The three comrades, inspired by their love of the game and their newfound "fancy college educations," set out to create a software company that catered to the needs of hockey organizations. From its humble beginnings in a dorm room, SportsEngine has grown into a successful web software company that now empowers thousands of sports organizations and events around the world... including Justin's alma mater, the Shakopee Youth Hockey Association. 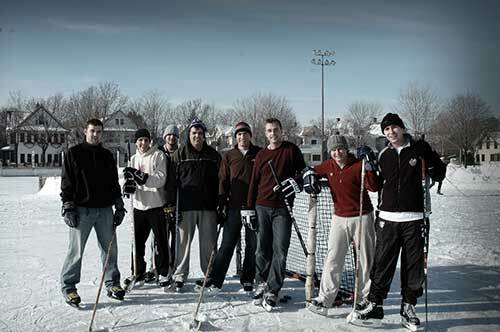 The company, headquartered in Northeast Minneapolis, still lives and breathes hockey the way nature intended it, with Justin, Carson, and Greg heading up lunch-hour hockey games with the rest of the SportsEngine staff at nearby Logan Park. In an event of destiny in 2010, Justin, Carson, Greg and the rest of the SportsEngine team stepped forward to be the new stewards of the Golden Shovel and the beloved tradition of the U.S. Pond Hockey Championships. Their passion for the purity of the sport along with their commitment to excellence continue to make this tournament the best pond hockey tournament in the country. They have heeded the call and have pledged to protect the spiritual sanctum that is The Pond.
. . . now that’s pond hockey.